I recently made an appointment at PHYTO Universe. Keep reading for all the details of this amazing experience. 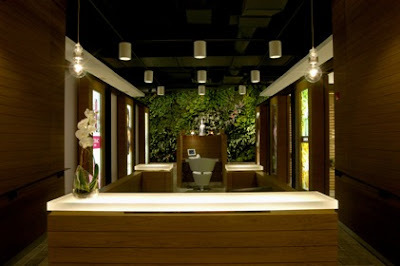 Now, PHYTO Universe is not your average hair salon. In fact, it's not a salon at all. PHYTO Universe is considered a spa for your hair. This is apparent from the moment you walk in the front door -- soft music plays, the space is light and open, and there's nary a blowdryer or hairstylist's tool belt in sight. Across the back wall is a 2850-square-foot “vertical garden” made entirely of tropical plants -- it's seriously stunning. At my appointment with Ronald Williams, I was treated to two luxurious hours of hair therapy and utter relaxation ... though when we first began our journey together, I was a bit apprehensive! You see, the treatments start with a complimentary hair analysis with the Phyto hair scope -- which magnifies the hair and scalp 200 times. You see each individual hair shaft and follicle and the condition of your scalp closer than you ever thought possible ... or necessary! Luckily, my hair was in pretty good shape, according to Ronald -- it was strong, thick (a whopping three hairs grow out of every root on my head!) and had little to no buildup or oiliness. Whew! So Ronald decided to prescribe a treatment that would restore shine and vitality to my hair, since it was looking and feeling just a bit dry from the summer heat and humidity. That's where the real fun started. As he and I chatted about our love of True Blood (thankfully he's into vampires just like me!) and I ate my delicious cookies (they bring them in from a little bakery in the city), he mixed up concoction after concoction to restore my hair's vibrance. The treatment Ronald chose for me was the Botanical Bliss. This treatment involves a multitude of essential oils, deep conditioners and masks that make hair stronger and full of life. The best part was that I never left my chair -- everything took place in one room, even a basin was brought to me when Ronald washed the products out of my locks! After putting the oils into my hair, he then settled me under a huge steamer for about 20 minutes to let them really soak in. He followed with mask after mask, treatment after treatment, until my hair was so soft and silky, my fingers slipped right out of it as I tried to run them through it! Ronald finished with a fabulous blowout that gave my hair just a little bit of bounce and height -- and it lasted for three days. A MIRACLE. The end result -- bouncy, shiny, utterly touchable tresses that have looked amazing ever since! The Botanical Bliss is $160 for 90 minutes. For more information on this treatment, to see the other treatments offered or to make an appointment, visit phytouniverse.com or call 212-308-0270. PHYTO Universe is located at 715 Lexington Avenue, on the corner of 58th Street.